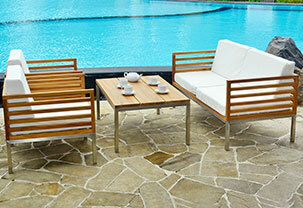 Atlanteak Furniture is furniture manufacturer and exporter from Indonesia. The line of products is focusing on teak wood furniture to accomplish all modern living spaces, whether intended for indoor furniture or outdoors. All the furniture collections are made from finest teak wood material to meet worldwide market demand of teak wood Garden Furniture Indonesia. Our Teak furniture produced from teak wood plantation grown only and 100% kiln dried solid Teak wood. We have ship more than hundred containers a year to many country, from five continent in the word : Middle east, Europe : France, UK, Belgium, Italia, Germany, Spain. Australia, new zealand. Shout Afrika, USA, Brasil. Hongkong, Taiwan. Our customer happy with our products and also grow and grow. All the teak furniture collections of Atlanteak Furniture are available table, bench, chair, rack and indoor furniture, for instance, drawer, bookshelves and more. All the Atlanteak Furniture collections of teak furniture have been through production processes in accordance to quality standards of export. Start from choosing the materials, processing until it is being packed. All those steps ensure the products quality. The collections of Atlanteak Furniture Indonesia are designed in various designs to complete any market demand of teak wood furniture. Hope you enjoy our collection of teak wood furniture, both indoor and outdoor furniture. If you have any query or any information needed related to our products, please contact us.